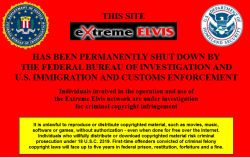 Have you chanced upon a site recently that was shutdown by Immigrations and Customs Enforcement? Since raiding immigrant homes and workplaces was not enough, ICE is now prowling the web for not only copyright violations, but words associated with terrorism, and shutting down websites. Actually, the Motion Picture Association of America has been trying to recruit Homeland Security for quite a while, especially to protect the summer blockbusters. One wonders why duds like Prince of Persia and The Last Airbender need any protection from piracy at all. Still, last month, ICE shutdown hundreds of movie sites in cooperation with Disney. It looks like movie piracy is now an issue of national security and one where ICE will ensnare more United States citizens for the benefit of private corporations. This also brings up the issue of the Department of Homeland Security (DHS) increasingly monitoring particular search terms and combinations of words on websites and emails. Homeland Security officials do visit and read pro-migrant blogs. How long before sites critical of DHS and ICE are seized as a matter of shutting down domains that allegedly promote terrorist activities? The Senate Homeland Security Committee already approved an internet kill-switch bill that would give the President authority to shut down the internet in the event of an emergency. Sorry, you can’t play Mafia Wars during the next state of emergency. Of course, no amount of building walls and monitoring words would change the minds or behavior of those who are allegedly planning to harm the United States. Instead, what we have on our hands is further invasion of our privacy in the name of securing our homeland. It’s not clear what or whom DHS is protecting, but they are surely bent on destroying any semblance of democracy.